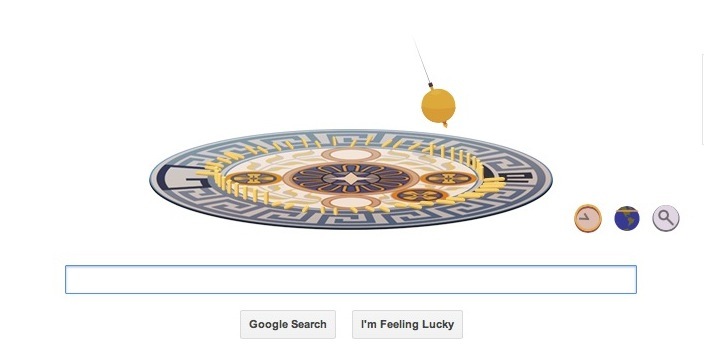 If you encountered a pendulum going round in the Google page this morning it is because the Google Doodle is celebrating the birthday of Jean Bernard Léon Foucault, a French physicist and inventor of a pendulum that demonstrated the rotation of the earth. Among other things he is credited with making an early measurement of the speed of light. Foucault was born in Paris in 1819, where he initially studied medicine but soon switched to physics (hurray!). He demonstrated his 67-metre, 28kg pendulum at the Panthéon in Paris in 1851. The plane of motion of the pendulum with respect to the earth, rotated slowly clockwise.